Click here to email this page to a friend. 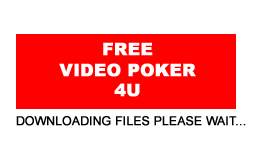 Overview: Our Free Double Joker Poker Video Poker game is a single hand type video poker machine. It is played with a 54 card deck which is shuffled before each hand. The extra 2 cards are the Jokers which are wild cards. Double Joker Video Poker is most similar to Joker Video Poker the most obvious difference being the extra Joker (making for 1 more wild card) and the missing Kings or Better Payout option. Wild Cards: Jokers are Wild and substitute any other card to make up the best possible winning combination. Winning Hands: Double Joker Poker can be won by getting any one of 10 winning hands, these are; Natural Royal Flush, Five of a Kind, Joker Royal Flush, Straight Flush, Four of a Kind, Full House, Flush, Straight, Three of a Kind, Two Pairs. Gamble Game: After each winning hand you will have the chance to choose to either collect your winnings or to gamble (press the Double Button). If you choose to gamble 5 cards will be laid out and the card on the left will be turned face up. You then have to choose a card with a high value than the face up card. If you choose a higher card your winnings are doubled and you have the option to collect or double again. If you choose a lower value card you lose your winnings from that hand (and any previous rounds of doubling following that winning hand). Similar Free Video Poker Games: If you like our Double Joker Poker Video Poker game you might also enjoy playing our Double Double Bonus Video Poker which offers you even more winnings hands, or you could try another wild card game like Free Deuces Wild Video Poker which has 4 wild cards (all the deuces are wild). Or you could give playing 2, 3 or even 4 hands at a time a try with our Free Multi Hand Aces and Faces Video Poker.